In this course we'll give an introduction to variety of topics from hardware to software. The course will follow roughly the same structure as Computer Science 101 at Stanford University with more hands-on approach. This course substitutes Estonian courses I100 Sissejuhatus informaatikasse and I201 Arvutid. Video recordings: 2016 fall, 2015 fall. Exam of 50 points, preparation in lectures and general discussion in workshops. Assignments, see instructions and points below. Extra points for improving quality of wiki articles, extracurricular work and also helping others, see points below. Exam will be halfway between oral and written: You'll be given 30 minutes to prepare for several random questions and 15 minutes to discuss what you've answered. If you don't have prior experience with the topics, it's highly recommended to take part of the sessions in order to pass the exam. You can use a calculator and this wiki page, don't rely on the access to terminal or other software tools. You can not access Internet or any remote computers. What is the purpose of Flash Translation Layer in terms of solid state drives? What are difference between volatile/non-volatile, RAM, ROM, EEPROM and where are they used? What are difference between asynchronous/synchronous, dynamic/static RAM and where are they used? What is cache? What is cache coherence? Explain how computer mouse works? History of computer mouse. What are the benefits of twisted pair cabling and differential signalling? What is a block device? What is logical block addressing and what are the benefits compared to older cylinder-head-sector addressing method in terms of harddisks? What is a disk partition? What is a file system? What is journaling in terms of filesystems and what are the benefits? Name some journaled filesystems in use nowadays. In this lecture we'll discuss how a computer boots and how an operating system kernel is loaded. Jargon: BIOS (basic input/output system), UEFI (Unified Extensible Firmware Interface), bootloader, kernel, process, context switch, x86 real/protected mode, paged virtual memory, swap/pagefile, kernelspace/supervisor mode, userspace, hypervisor mode (ring -1), system management mode aka (ring -2). What is the role of BIOS/UEFI in x86-based machines? Explain step by step how operating system is booted up, see slides for flowchart. Describe the functionality provided by general purpose operating system. See architecture of Windows NT, Android, OS X. What are the main differences between real mode and protected mode of x86-based processor? What happens during context switch? What is the purpose of paged virtual memory? Security section: DMA attack, editing GRUB entries to gain root shell without password prompt, 20 years old security exploit in x86 processors. Security section: HTTP.sys bug crashes IIS web servers, OpenSSL bug Heartbleed. What are the major steps of compilation? What are the differences between interpreted, JIT-compilation and traditional compiling? What is control flow? Loops? Conditional statements? In this lecture we'll talk about bits, bytes, integers, strings, pixels, audio encodings, video encoding etc. What is bit? Nibble? Byte? Word? Write 9375 in binary, hexadecimal? How are dates/time stored in binary? What is quantization in terms of signal processing? How are integers stored in binary? What integer range can be described using n bits? How many bits are required to describe integer range from n .. m.
What is the difference between CMYK and RGB color models? How are YUV, HSV and HSL colorspaces related to RGB? What are sRGB and YCbCr and where are they used? How is data encoded on audio CD-s? What is the capacity of an audio CD? What is sampling rate? What is bit depth? What is resolution? What is JPEG suitable for? Is JPEG lossy or lossless compression method? What is PNG suitable for? Does PNG support compression? How are time domain and frequency domain related in terms of signal processing? What is Fourier transform and where it is applied? It's highly reccommended to play around with simulators here is one for MIPS processors. In this lecture we'll talk about different processor architectures, instructions, pipelining, function calls, jumps, loops etc. Given ~10 instructions and their explainations, follow the instructions and elaborate after every step what happened in the processor? What are the uses for hardware description languages? What is register? Register file? Show the circuit diagram for A OR B AND C, NOT A AND B, <insert some other Boole formula here>? Show the truth table for <insert Boole formula here>? Write the equivalent Boole formula of a circuit diagram. What are the major implications of MIT, BSD and GPL licenses? What are the differences between copyright, trademark, trade secret? Where would you use waterfall software development model? Where would you use agile? What is the purpose of a version control system? What would you store in a version control system? What is time complexity of algorithm? What is space complexity of algorithm? What is Moore's law? What is Rock's law? What were the major contributing factors for success of Microsoft, Apple, Google, <your favourite company>? What were the major contributing factors to the success of Silicon Valley? 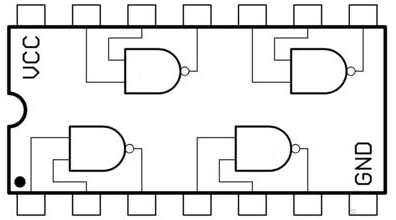 What distinguishes microcontroller from microprocessor? What are the differences between Hardvard architecture and von Neumann architecture? Goal: Get familiar with your laptop hardware. Get out of the comfort zone of your primary operating system and try out other operating systems. Learn about hardware virtualization. Read the instructions before you act. Place your preferred ISO image to a memory stick using dd or Win32 Disk Imager and boot it on your personal laptop. You do not need to install Ubuntu on your harddisk, simply click Try Ubuntu once the operating system boots off the memory stick and carry out following tasks. Open up terminal by pressing Ctrl-Alt-T.
Use lsb_release -a to check what operating system distribution you're running, try apt install lsb-release if command is not available. Use uname -sr to check what operating system kernel you're running. Use cat /proc/cpuinfo and check processor information. What CPU model and how many cores your computer has? Use arch to check what CPU architecture is being used by the operating system. Is it 32-bit or 64-bit? Use cat /proc/meminfo to check memory usage. How much RAM your computer has? Use lspci -t -v -nn to enumerate PCI and PCI Express devices, attempt to identify what is what, try apt install pciutils if command is not available. Use lsusb and lsusb -t to enumerate USB devices, again attempt to identify what is what, try apt install usbutils if command is not available. Use sudo fdisk -l to enumerate disks and partitions. How big is your harddisk? How many and how big partitions it has? Use lsblk to enumerate block devices. Use xrandr to enumerate display outputs. What video output resolutions are available and which one is currently used? Use cat /proc/asound/cards to check which audio devices are available. Use dmidecode to see even more information about your computer. Use ifconfig -a or ip addr list to list all network interfaces. Use iwconfig or iw list to list all wireless network interfaces. Is your wireless network interface detected? If not take a guess why? Use hcitool dev to list bluetooth host controller. Is your bluetooth device detected? What audio card is your machine using? What bus is it using? What graphics controller is your machine using? What bus is it using? What webcam is your machine using? What bus is it using? What wired network chipset your computer has? What bus is it using? What wireless network chipset your computer has? What bus is it using? What Bluetooth device your computer has? What bus is it using? Is there a cellular modem connected and how it's connected? Boot the ISO image in VirtualBox and follow the same steps as above, what are the differences and why? Answer to questions above and send it as plain text e-mail to Lauri, make sure you use the address supplied above with the course code, otherwise your mail is not searchable in my mailbox. Attach collected command outputs as plain text file, do not send .odt, .doc files, these are not readable on my smartphone. When answering to questions phrase the text in a way that is understandable out of context, so I don't have to open up wiki to understand what you're talking about. Note that I can't expect you to install Ubuntu on your physical machine, but I can help if you want to do that. You should have Ubuntu ready to go in a virtual machine at least for subsequent sessions. We're using Ubuntu because it's widely used on servers and in the cloud, so any Ubuntu skills will definitely come handy in future. If you're already familiar with Linux, it's suggested to take a look at other interesting operating systems such as FreeBSD or OpenBSD. Take a look at Kali Linux if you're interested in penetration testing. Background: Most of the smartphones nowadays are using SoC built around ARM processor. Raspberry Pi is an excellent piece of hardware to for checking out how an ARM-based machine looks like. Goal: Get familiar with hardware ARM-based hardware. Read the instructions before you get busy. Boot Raspbian on Raspberry Pi. Use the commands described in previous assignment to examine the environment of Raspbian on Raspberry Pi. What are the major differences compares to your laptop and virtual machine? What buses is Raspberry Pi making use of? What filesystems is Raspbian making use of? Answer to questions above and send it as e-mail to Lauri, make sure you use the address supplied above with the course code, otherwise your mail is not searchable in my mailbox. Attach collected command outputs as plain text file, do not send .odt, .doc files, these are not readable on a phone. When answering to questions phrase the text in a way that is understandable out of context, so it is not necessary to open up wiki to understand what you're talking about. LAMP software bundle is consists of Linux-based OS, Apache web server, PHP programming language runtime and MySQL database. Most of the web applications on the Internet including Facebook are built on top of LAMP-styled software stack. Use a Ubuntu server virtual machine to set up WordPress, ownCloud or any well-known web application that makes use of a database such as MySQL. To make your life easier also set up SSH public key authentication. Goal: Get familiar with LAMP stack. Get comfortable with (SSH) public key authentication. Use SSH to connect to your server over the network. If you're using Windows on your laptop use PuTTY to gain access to command line and WinSCP to copy files, otherwise simply boot Ubuntu in a virtual machine and use ssh username@hostname to invoke commands and sftp://username@hostname in the file browser to access filesystem. Set up any of the web applications referenced above in /var/www/html. You may be interested in reading also this and this. Demonstrate that the web application you installed works in next lab, screenshots/photos with explanation sent to e-mail above also suffice. Optional: Set up SSH public key authentication to enos.itcollege.ee. Optional: Set up public key authentication to your Ubuntu box. Windows users might want to take a look at PuTTYgen instructions. Note: If you're maintaining similar installation of a production server that is accepted as well. WAMP on Windows is also accepted. Internet of Things is one of the emerging technologies (read: hype). IoT is essentially about getting everything online, including lightbulbs, switches, window shades etc. In this assignment LED symbolizes a light and the task is to implement code which allows user to switch the LED on and off over the network. Goal: Get familiar how Python code can be started up. Build basic IoT appliance, a light that can be turned on and off via the Internet. Complete the Python track at CodeAcademy if you haven't done that yet. 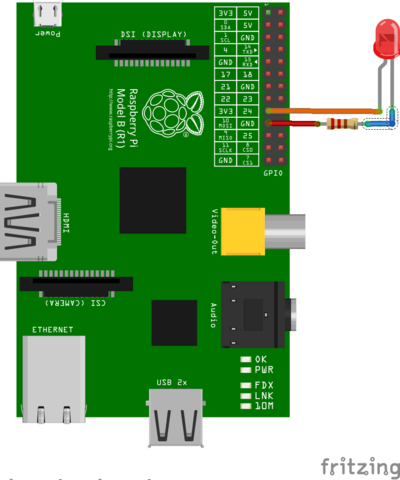 Follow the wiki page Blinking LED section under Getting started with Raspberry Pi. Get an LED blinking on command-line. Get LED blinking from Python code. Get basic HTTP server running in Python. Combine all of the above, build an HTTP server that can be used to turn LED on and off from via web browser. Optional: Take a peek at next assignment and upload working version to GitHub. Optional: Smoothen the transitions using PWM. Goal: Get familiar with distributed version control systems. Collaborate. Create GitHub account if you haven't done so yet. Install Git on your Raspberry Pi by using apt-get install git. Clone the repository to your Raspberry Pi using git clone http://github.com/your-username/rpi-iot-example. Move the Python code created earlier to the Git repository directory. Use git add to add the files. Configure full name: git config --global user.name "Firstname Surname"
Use git commit to create the initial commit. Use git push to push the commits to GitHub server. Set up public key authentication between your laptop and GitHub servers, verify that https://github.com/username.keys gives the expected result. Use git clone to clone the repository to your laptop. Ubuntu should first apt-get install git, Windows and Mac users might want to take a look at Git homepage. If you're looking for graphical user interface take a look at GitHub Desktop or TortoiseGit. Create README in the repository directory, populate it with relevant content - what is it about, who made it etc and commit the changes. 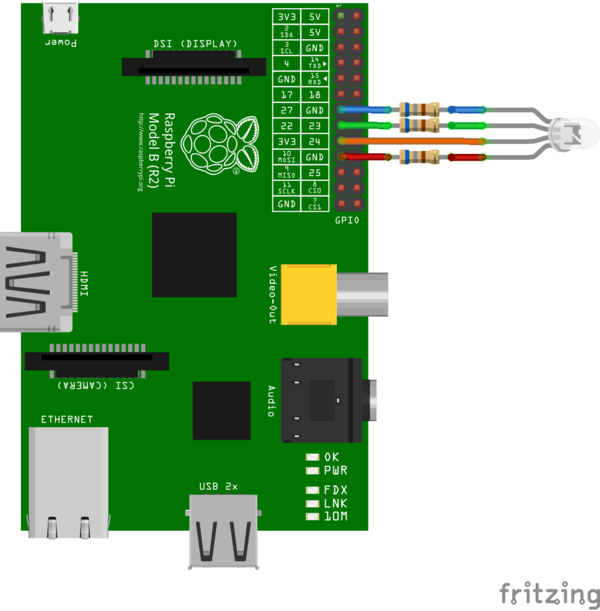 In your Raspberry Pi setup RGB LED should be connected as shown above. Clone fellow student's repository and adapt the code to reflect physical changes to the setup, the Python snippet should now permit changing the color of the light, have it blinking and turn it off. Other interesting modes are awarded with extra points, eg use HTML5 input type range. Use either Atlassian Tutorials, git - the simple guide or Try Git as a reference if you get lost. Document in the README what GPIO pins are used in the code for red, green and blue. Extra points for making the Python code configurable from command-line. Late submissions will heavily lose points for failure to comply with decent commit messages. Send Lauri the URL of your repository at GitHub. Git resources: Pro Git Book (read the basics to get kickstarted) and Codecademy Git course. @ link register save eliminated. .ident	"GCC: (Ubuntu/Linaro 4.7.3-12ubuntu1) 4.7.3"
When we execute the function with for example arguments base=5 and exponent=3 following happens in the processor. Note that this will essentially calculates 5 ^ 3 (5 to the power of 3) which is 125. Following has been done manually to illustrate how much time does it take to execute the the function. If you get lost with the ARM register naming conventions use following as a guide. Be aware, this software is not well optimised and might have memory leaks and high CPU usage. Also note that this is an emulator, some assembly instructions might be missing and there are syntactic differences, as an example instead of PUSH, STMDB should be used (all credit to Ardi Vaba). Lauri: PUSH and POP instructions are aliases for LDR and STR instructions, use -fverbose-asm flag and remove optimization flags for GCC to get verbose assembly without aliases. Code example for VisUAL below. ; Don't attempt to compile to assembly the program which has printf and main! Follow the instructions and elaborate what are the values left in the registers after the instruction finishes executing. Instruction a1 a2 a3 a4 ... sp lr pc Top of the stack What happened? What does this function do? Given the function for finding the largest value in an array use ARM cross compiler as shown above to generate the assembly corresponding to the C source code (3p). Remove the compiler hints (mostly lines starting with dot), this should leave you less than 20 instructions. If it's more than that try different optimization flags. Analyze and comment the assembly as shown above (3p). Bob had to ship the ALU design to the hardware manufacturer by yesterday. The project manager is angry about missed deadline. Bob still hasn't figured out why the ALU is not working properly. Help Bob by figuring out what's the problem. However there are few bugs in alu.vhd, find the bugs and correct them. If this is your first experience with VHDL, take a look here. Each CD74HC00E chip contains four NAND gates arranged like this, observe the pit on the left. VCC corresponds to 5V power supply and GND corresponds to ground or 0V. 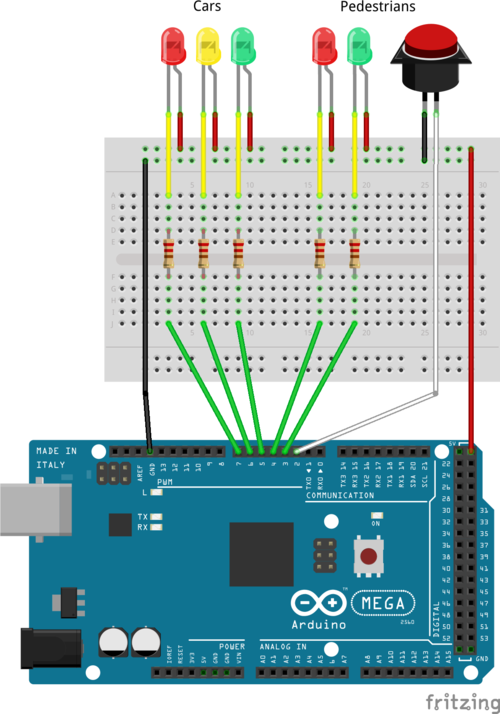 Use following code snippet on Arduino to test the circuit, it will shuffle through all the possible inputs and test whether the expected output is on the output pins. If you see sum or cout outputs giving 0 all the time it's likely you have resistors of too low resistance in the circuit which is draining all the voltage on the NAND gate output pins. In the IoT assignment we already played around with ESP32 microcontroller, most microcontroller concepts are the same for Arduino (interrupts, PWM, etc). In this assignment we use Arduino to implement traffic lights for crossroads. If you don't care much about doing this assignment hands on, you can give a try online. Install Arduino IDE on your personal machine, on Windows/Mac check out Arduino homepage for instructions, on Ubuntu apt install arduino should suffice. You can also use school computers, Ubuntu has Arduino preinstalled. On Ubuntu you may have to add yourself to the dialout group before you can access the serial ports. Use the command sudo gpasswd -a $USER dialout, log out and log in again to your PC. Press the second button in the toolbar to upload the code, make sure the changes take effect on the board. You should see on-board LED blinking. Use serial interface to send messages to your PC. // Don't do anything else here! The repository should show changes you've made over at least few days. The repository has to contain only plaintext files unless there is a really good reason not to (eg. images). There has to be authorship information in the files. Add .gitignore file to your GitHub repositories to ignore temporary files, see Git docs for more details. Who is the copyright holder? Under which conditions is redistribution permitted? What is the repository about? How can the author be contacted? E-mail address, IRC chat channel on Freenode, Skype username? How can the code be used? What hardware is necessary? How should the user wire the circuit to make it work? Add images if necessary. What is the policy for including changes from third party developers? Here you can claim extra credit points for various tasks, this is mostly to improve the quality of wiki.itcollege.ee. Once you have taken care of the task insert your name in the end of the line with corresponding date. This page was last edited on 12 December 2017, at 11:55.